National, local agencies take part in massive operation to care for hundreds of cats exposed to H7N2 virus. 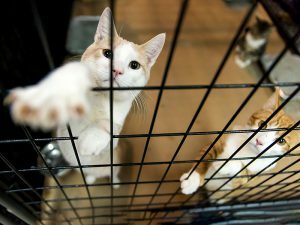 Animal Care Centers of NYC (ACC) to resume operations within two weeks. 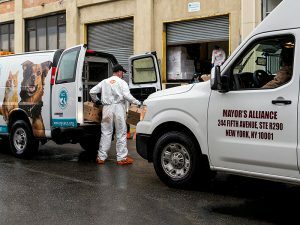 Wednesday, January 12, 2017 – New York, NY – In coordination with the New York City Health Department (DOHMH) and Animal Care Centers of NYC (ACC), the ASPCA® (American Society for the Prevention of Cruelty to Animals®) — with funding provided by Maddie’s Fund® — has established a temporary quarantine shelter in Queens to care for hundreds of cats exposed to the avian flu virus, H7N2. 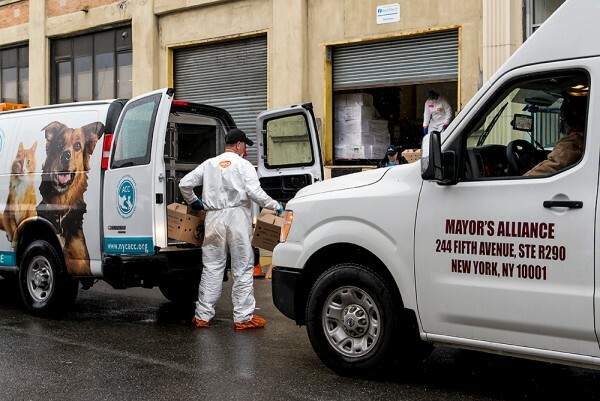 Last week, more than 450 cats from ACC shelters in Manhattan, Brooklyn, and Staten Island were transported to the temporary shelter by ACC and the Mayor’s Alliance for NYC’s Animals. 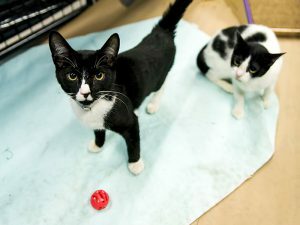 The cats will be quarantined at the facility until ongoing lab tests, conducted by the Shelter Medicine Program at the University of Wisconsin School of Veterinary Medicine, show they are healthy and no longer contagious — likely 45 to 90 days. 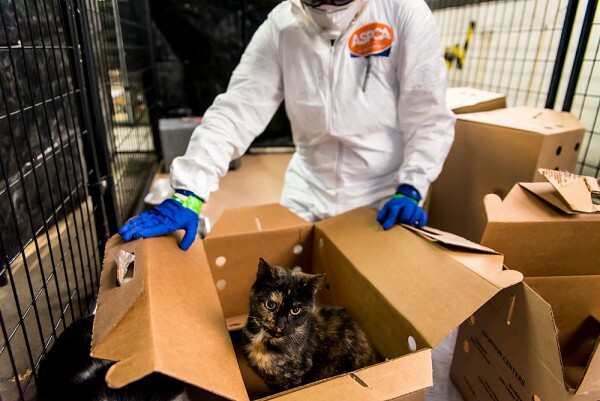 ASPCA responders as well as volunteers from other agencies are providing ongoing daily care while veterinary experts closely monitor the cats during the quarantine period. While some of the cats are showing mild flu-like symptoms such as sneezing or runny nose, others are doing well and settling in at the temporary shelter. 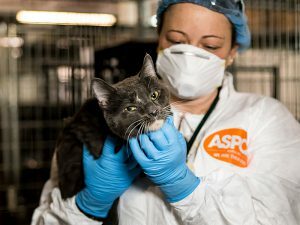 “I thank our partners at the ASPCA, ACC, Mayor’s Alliance, and Maddie’s Fund for their unwavering commitment to providing the best care for these cats. This unprecedented effort was made possible by their support. 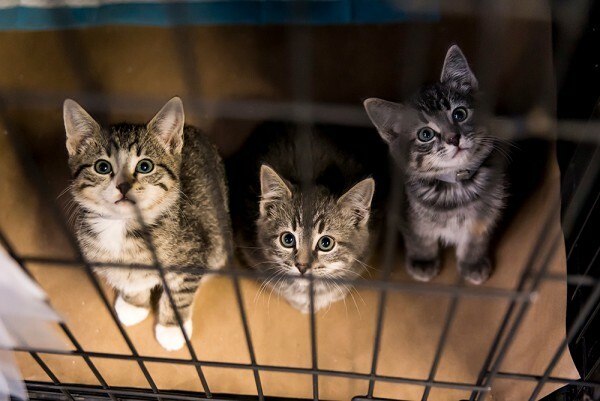 We continue to urge New Yorkers who have adopted cats from ACC shelters to be on alert for symptoms in their pets and take proper precautions,” said Health Commissioner Dr. Mary T. Bassett. H7N2 is a type of avian influenza virus (bird flu) that sometimes mutates and transfers to mammals, such as cats. The Health Department reports that most infected cats have experienced only mild illness, and no other animal species at ACC have tested positive for H7N2. 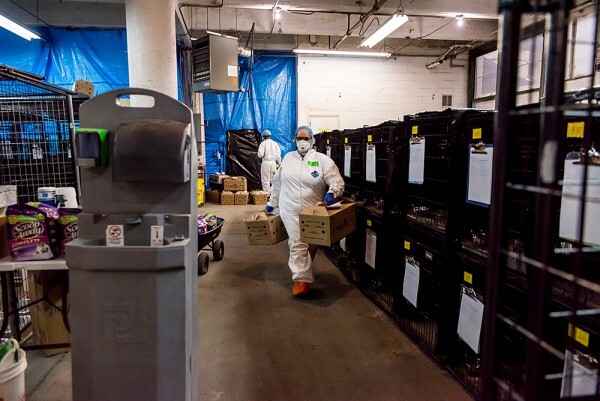 The Health Department investigation of the H7N2 virus confirmed that the risk to humans is low. There has been only one cat-to-human transmission associated with this outbreak; there have been no cases of human-to-human transmission. 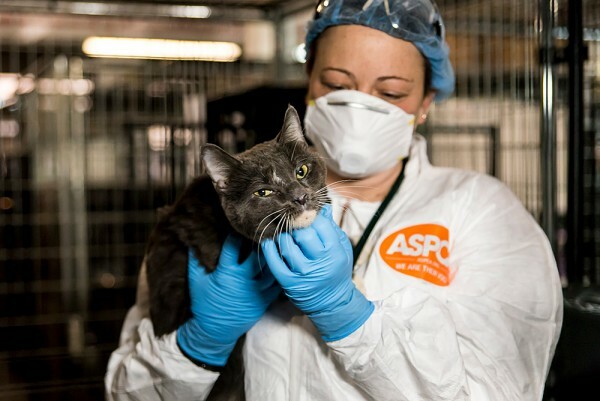 Under the Health Department’s guidance, the ASPCA has implemented strict protocols to ensure the safety of the responders and cats. These include decontamination training and personal protective equipment for all individuals in direct contact with cats from this population. 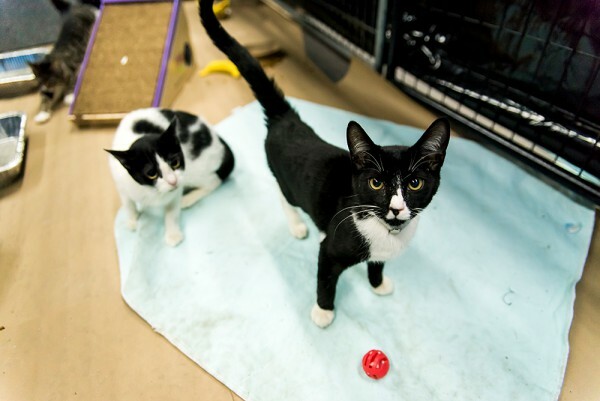 ACC has hired a professional cleaning company to service all facilities and they will resume cat adoptions once the cleaning process is complete. New Yorkers who adopted a cat from an ACC shelter between November 12 and December 15 should continue to monitor their cats for flu-like symptoms, including sneezing, coughing, runny nose, and runny or red eyes. If such symptoms are present, these owners should take their cats to a veterinarian and inform them that the cats may have been exposed to H7N2. This will allow the veterinarians to make arrangements to prevent exposure to other cats in the clinic. 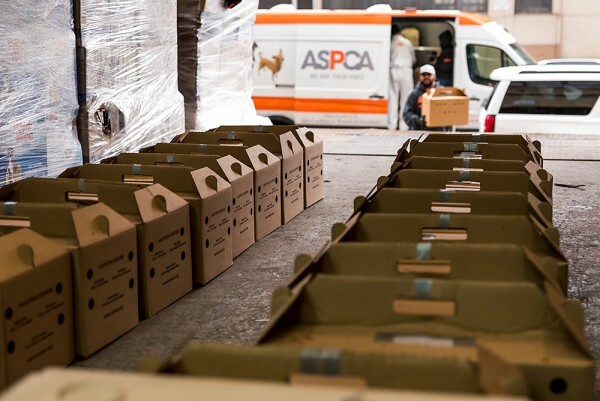 The sheltering and quarantine operation has been made possible by the generous funding from the ASPCA and Maddie’s Fund, a family foundation established by Dave and Cheryl Duffield to revolutionize the status and well-being of companion animals. Maddie’s Fund has also committed to providing grant support to defray veterinary costs incurred by eligible rescue groups that received cats from ACC and treated them for symptoms associated with the virus, medical care to the ACC cats that are in quarantine, testing and retesting of all affected cats, travel expenses for the shelter medicine intern teams, as well as thorough cleaning of three ACC shelters. Agencies assisting with veterinary and daily care at the shelter include: ACC; Cat Depot (Sarasota, Fla.); Coastal Humane Society (Brunswick, Maine); Florida State Animal Response Coalition (Bushnell, Fla.); Humane Society for Greater Savannah (Ga.); Longmont Humane Society (Longmont, Colo.); Mayor’s Alliance for NYC Animals; San Diego Humane Society (Calif.); Shelter Medicine Program at the University of Wisconsin School of Veterinary Medicine (Madison, Wis.); The Animal Support Project (Cropseyville, N.Y.); Washington State Animal Response Team (Enumclaw, Wash.); and Wayside Waifs (Kansas City, Mo.). Founded in 1866, the ASPCA® (American Society for the Prevention of Cruelty to Animals®) is the first animal welfare organization in North America and serves as the nation’s leading voice for animals. 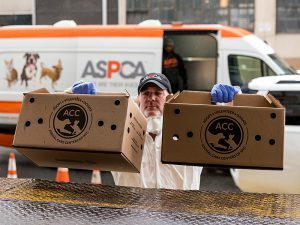 More than two million supporters strong, the ASPCA’s mission is to provide effective means for the prevention of cruelty to animals throughout the United States. 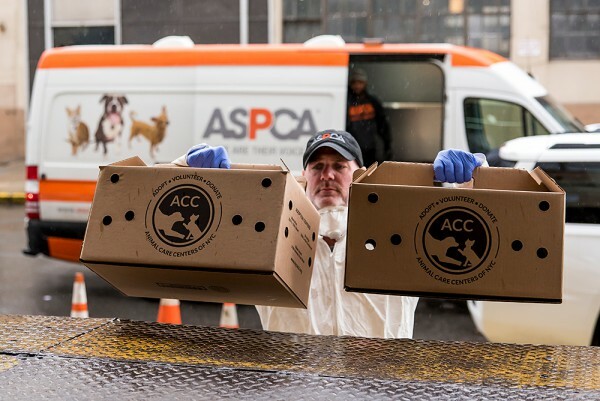 As a 501(c)(3) not-for-profit corporation, the ASPCA is a national leader in the areas of anti-cruelty, community outreach and animal health services. For more information, please visit ASPCA.org, and be sure to follow the ASPCA on Facebook, Twitter, and Instagram. Animal Care Centers of NYC (ACC) is one of the largest animal welfare organizations in the country, taking in nearly 35,000 animals each year. ACC is a 501(c)(3) nonprofit that rescues, cares for and finds loving homes for animals throughout the five boroughs. 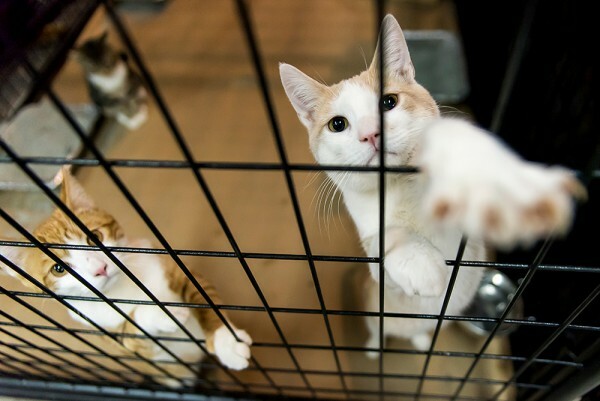 ACC is an open-admissions organization, which means it never turns away any homeless, abandoned, injured or sick animal in need of help, including cats, dogs, rabbits, small mammals, reptiles, birds, farm animals and wildlife. It is the only organization in NYC with this unique responsibility. For more information, please visit nycacc.org, and be sure to follow NYCACC on Facebook, Twitter, and Instagram.